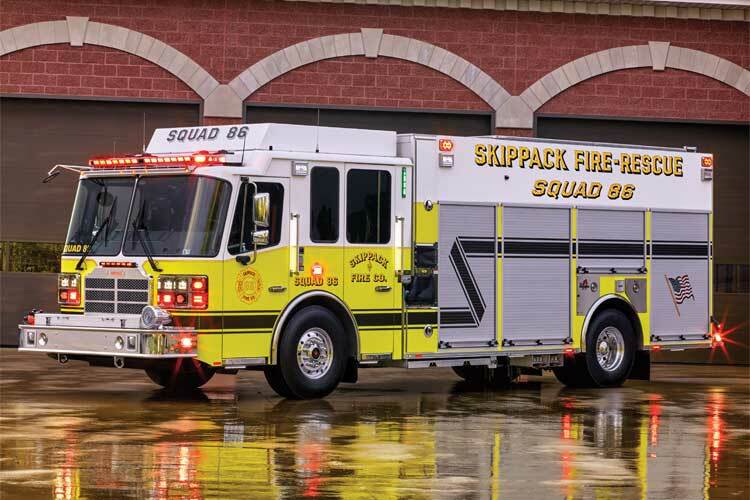 The Skippack (PA) Fire Company runs to a lot of motor vehicle accidents where it sends its heavy rescue, backed up by a pumper in case water has to be flowed. But, the process means that two vehicles would respond to a call when perhaps one would be sufficient, so the fire company decided to replace its heavy rescue with a rescue pumper. The MVP rescue pumper is on an Igniter chassis with seating for six firefighters in the raised-roof cab and has an extruded aluminum body, a side-mount Hale Qmax-XS 2,000-gallon-per-minute (gpm) pump, a 750-gallon water tank, a 30-gallon foam cell, and a Hale Foam Logix 3.3 foam system. Bob Kaler, president of Kaler Motor Company, who sold the rig to Skippack, says the department wanted to carry a 28-foot two-section extension ladder and adds, “which is very hard to store on a typical length vehicle. We installed a single arm enclosed ladder rack on the right side of the vehicle that is flush with the top and sides of the body, where the ladders slide out the back of the ladder box.” The ladder box also holds a 16-foot roof ladder, a 10-foot attic ladder, two 15-foot by six-inch hard suction hose lengths, and two pike pole tubes. Wheelbase on the MVP rescue pumper is 215 inches, overall length is 34 feet 2½ inches, and overall height is 10 feet 4 7/8 inches. Marriott notes that Skippack carries 1,500 feet of 5-inch LDH in the vehicle’s hosebed, which is covered by an electric hosebed cover. The deck gun is a Task Force Tips (TFT) monitor with a TFT Extend-A-Gun underneath and with a second deck gun controller at the top. The rig has three speedlays, two holding 200 feet of two-inch hose, and one 300 feet of two-inch line, all racked on removable trays. There is a 2½-inch discharge on each side of the pump panel, a front bumper 2½-inch discharge, a rear 5-inch intake, and two 3-inch preconnected hoselines at the rear—one capped by a Task Force Tips Blitzfire. The rescue-pumper is set up so rescue equipment is carried on the right side of the vehicle, including the department’s Holmatro CORE technology hydraulic tools, hydraulic hoselines, and two Holmatro hydraulic pumps, as well as cribbing and other rescue equipment, according to Marriott. The left side of the rescue-pumper is set up mostly for fire suppression, although there is a compartment over the pump panel that holds a Stokes basket, he adds. Kaler notes that the rescue-pumper has a Will-Burt light tower protected by a shroud so the assembly matches the body of the vehicle, Tomar Electronics LED scene lights, a Tomar Electronics Scorpion LED light bar, LED headlights, and Whelen LED warning lights.